Aumann’s agreement theorem says that Bayesians with common priors who know one another’s posteriors must agree. There’s no apparent reason this shouldn’t apply to posteriors arrived at using indexical information. This does not mean that you and I should both believe we are as likely to be the author of this blog, but that we should agree on the chances that I am. The Self-Sampling Assumption (SSA) does not allow for this agreement between people with different reference classes, as I shall demonstrate. Consider the figure below. Suppose A people and B people both begin with an equal prior over the two worlds. Everyone knows their type (A or B), but other than that they do not know their location. For instance an A person may be in any of eight places, as far as they know. A people consider their reference class to be A people only. B people consider their reference class to be B people only. The people who are standing next to each other in the diagram meet and exchange their knowledge. For instance an A person meeting a B person will learn that the B person is a B person, and that they don’t know anything much else. When A people meet B people, they both come to know what the other person’s posterior is. For instance an A person who meets a B person knows that the B person doesn’t know anything except that they are a B person who met an A person. From this the A person can work out the B person’s posterior over which world they are in. Suppose everyone uses SSA. When an A person and a B person meet, the A people come to think they are four times as likely to be in World 1. This is because in world two, only a quarter of A people meet a B person, whereas in world 1 they all do. The B people they meet cannot agree – in either world they expected to talk with an A person, and for that A person to be pretty sure they are in world 1. So despite knowing one another’s posteriors and having common priors over which world exists, the A and B people who meet must disagree. Not only on one another’s locations within the world, but over which world they are in*. An example of this would be a husband and wife celebrating their wedding in a Chinese town with poor census data and an ongoing gender gap. The husband exclaims ‘wow, I am a husband! The disparity between gender populations in this town is probably smaller than I thought’. His wife expected in any case that she would end up with a husband who would make this inference from their marriage, and so cannot update and agree with him. Notice that neither partner need think the other has chosen the ‘wrong’ reference class in any way, it might be the reference class they would have chosen were they in that alternative indexical position. In both of these cases the Self-Indication Assumption (SIA) allows for perfect agreement. Recall SIA weights the probability of worlds by the number of people in them in your situation. 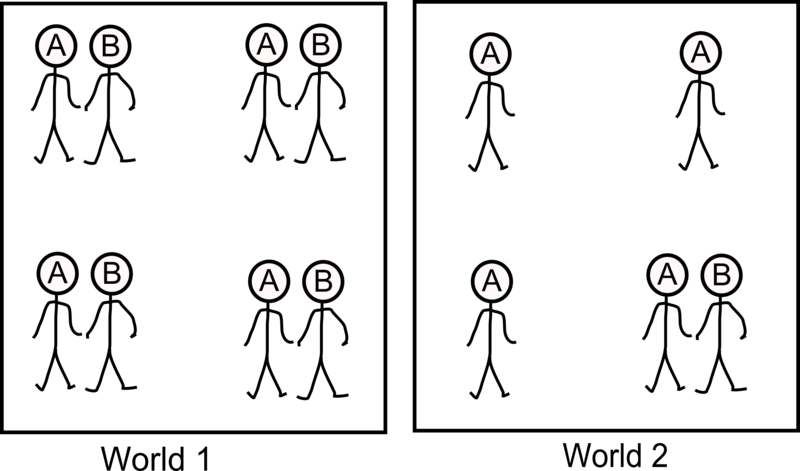 When A and B knowingly communicate, they are in symmetrical positions – either side of a communicating A and B pair. Both parties weight their hypotheses by the number of such pairs, and so they agree. Incidentally, when they first found out that they existed, and later when they learned their type, they did disagree. Communicating resolves this, instead of creating a disagreement as with SSA. *If this does not seem bad enough, they each agree that the other person reasoned as well as they did. Another implausible implication of this application of SSA is that you will come to agree with creatures that are more similar to you, even if you are certain that a given creature inside your reference class is identical to one outside your reference class in every aspect of its data collection and inference abilities. Each B wakes up thinking his or her chance of being in world 1 is 80%. A’s wake up thinking the chance of being in world 1 is 50%. Three A’s learn they are in world 2 with “probability” of 100%. Five A’s are told by B’s there is an 80% chance the pair is in world 1. Another way to think of it: Three A’s learn they are in world 2 with “probability” of 100%. They post status updates read by the other five A’s. This leaves (3*50%)/5=30% shift per other A that they should believe they are in world 1. 50%+30%=80%. How is it ever right to choose a reference class disregarding some of your information? I don’t mean choosing a reference class that disregards some of your information, but choosing a reference class without regard for some of your information. The SSA principle relies on the possibility of ignoring some of your information in forming your reference class, since it asks for the proportion of your reference class of whom all of your information is true. For any set of priors, in principle, can I *delete* any information from it, i.e. cause the thinker to “ignore some of [his or her] information in forming [his or her] reference class”? What I’m asking is if information can be treated like numbers in that you can always subtract some, even more than is there, e.g. you can take four and subtract seven from it. I ask because if you can it seems possible that in principle anyone is vulnerable to believing literally anything no matter their set of priors so long as they permit me to tell them what information to ignore. An ideal thinker should ignore information? Never. The reality is that that ignored information screens off inferior SSA information. This A vs. A+B disagreement is interesting. It means that using SSA, we’re not free to draw the boundaries around and between observers as we like, even if all components communicate; whereas with SIA, we are free to do so, because the parts must agree with the whole. This potentially makes SSA a less well-specified theory, since predictions depend on which subset of a communicating system one chooses to consider “the observer”. It seems that the notion of a reference class is vague enough that it can wriggle out of any paradox. The SSA optimist could interpret the A/B disagreement as constraining what the reference classes can be in this problem, instead of as an unavoidable flaw of SSA. For example, one could start from the position that both members of an A/B pair should be thought of as being in exactly the same epistemic situation. Maybe they don’t have the same experiences, since one experienced being an A while the other didn’t. Nonetheless, they know the same things because they communicated their knowledge with each other. From this position, it seems natural to say that the two members of an A/B pair are in the same reference class. More generally, after the meetings occur, the people in A/B pairs form one reference class, while the unpaired A-people form another reference class. (Since peoples’ reference classes are changing over time, the defender would really be using SSSA.) The upshot is that both members of an A/B pair agree that they are in World 1 with probability 1/2. The A-half of an A/B pair can further update on the indexical fact that he is the A-half of an A/B pair. But that will give the same result as the B-half gets when she updates on being the B-half. That is a handwavy justification for re-drawing the reference-class lines, but it seems as well-founded as Bostrom’s justification in his Sleeping Beauty “hybrid model” paper for saying that the post-learning-that-it’s-Monday Sleeping Beauty is in her own reference class. Yes, the reference class can be used to wriggle out of any paradox. It can’t be used to wiggle out of this argument only because the argument is premised on A and B being different reference classes. But then Sunday-SB assigns a posterior probability of 1/2 to HEADS, while Monday-SB assigns a posterior probability of 1/3. Each agent-slice knows the other’s posterior, knows that the other one knows the other’s posterior, etc. Yet their posteriors disagree, contrary to the spirit of Aumann’s theorem. Of course, SIA and FNC violate the hypotheses of Aumann’s theorem here. Aumann assumes (a) that the agents have the same prior and (b) that each agent’s possible experiences induce a partition of the set of possible worlds, so that each world is consistent with only one possible experience. Under SIA, the agent-slices have different priors, so (a) fails. Under FNC, Monday-SB’s possible experiences don’t partition the sample space, so (b) fails. For, let S and T be two possible sequences of die-rolls. Let w be the possible world where the coin comes up TAILS, sequence S occurs on Monday, and sequence T occurs on Tuesday. Then, whether Monday-SB sees S or sees T, her experience would be consistent with being in world w, so world w is consistent with two distinct experiences.